This news clipping from the St. Louis Globe-Democrat of August 16, 1972 was shared by Jack Moore from Mt. Hope, WV. (Car 685). Because of the quality of the photocopy, I typed in the text of the article below. A replica of the 1931 model-A roadster sitting in the show room of North County Camper Sales Inc. for the last two months has attracted about 200 curious car buffs. About three of them have taken a serious interest in the car priced at $ (cant read) but only one has paid the price. The car is made in West Palm Beach, Fla., by a company called Glassic and is distributed locally by the camper company at 1l755 Lewis and Clark blvd. 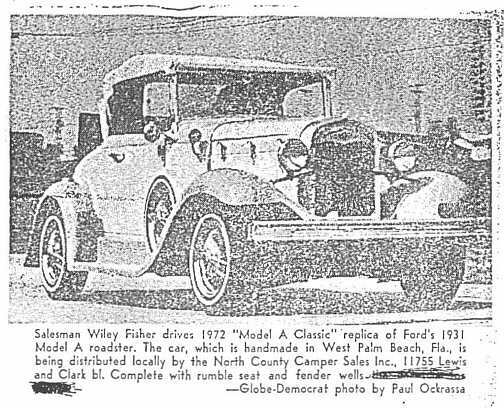 ASIDE FROM A FEW CHANGES, it looks like the car chat sold in 1931 for about 450 Skip Dalton, manager of North County Camper Sales, admits it would sell much better if it was lower priced." He called the car a "playtoy." "At that price it's out of the average mans range," he said. "Its for someone looking for something unique." The Glassic has a 302-cubic inch, V-S, 210-horsepower engine, which Dalton said is one of the best engines Ford ever made." Although it meets all federal safety standards, the replica is the most hazardous thing there is." according to salesman Robert Hunter, because its a traffic stopper." "No MATTER HOW FAST you go in this thing, people pass you just to see it," he added. And the roadster is no slow-poke. Dalton said it would easily go 100 miles per hour and cruise at 70 or 80. Although full scale, the car is not an exact replica. Rather than the hood lifting from the side, the entire top piece comes off. THE BUMPERS also vary somewhat from those on the original. The replica has a rear gas tank instead of one in the front, and a luggage rack in back which the original didnt have. The taillights are different, hubcaps replace real wire wheels, and 15-inch wheels are used rather than the original 19 inch ones. James H. Creal Sr. of Alton. Il., owner of art original 1931 Model A pointed out that the grill is more like the one on the 1928 than the 1931. "The body looks absolutely similar," he noted aside from some subtle changes:. "The Lines are identical except for the indentation in the front and bumper." Creel, who obviously had been overcome by curiosity, stopped in the showroom view the car. HE SAID HE HAD BOUGHT a 1931 Model A. unrestored, for $1,000 and after about three years of labor had restored the car to show condition. Creel said it costs between $3,000 and $5,000 to strip such a car down to its frame, finish each part by hand, replace missing parts or reproduce them and end up with a car that would sell for between $7,000 $7,500. The Glassic has a one-piece fiberglass body, a rumble seat that folds down when not in use, a yellow body with black pin stripes and fender wells on both sides which hold spare tires. The car has no power steering but for $300 extra you can get one with an automatic transmission.